Who is Anteros? In one story, Aphrodite, the mother of Eros, noticed that her child would not grow. Following the advice of her sister, Themis, she had a second child, fathered by Ares, the god of war. The story says that as long as Anteros was present, Eros would grow, but when Anteros was absent, Eros regressed. 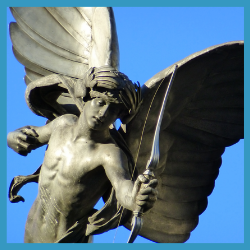 In this seminar we will track how the myth of Anteros disappears and reappears throughout the centuries, from classical Athens, through the Italian Renaissance, the French Enlightenment, English Modernism, and into our time. What is he doing tucked into the corner of a painting by Titian, or rationalized in an entry in the Encyclopédie of the French Enlightenment, or unacknowledged but standing at the center of Piccadilly Circus in London? We will consider the significance of how his forgotten myth resurfaces in so many different cultural contexts. And we will also ask how Anteros might challenge us in our experience of loving and in our understanding of the psychotherapeutic process.